I'm far from an expert, but this one looks great. Yes, it looks good, but I have to wonder about license plates from different states, then no license plate. Very sharp! Certainly for anyone interested deserves a serious look. Hope someone here can check it out. Nice car with nice options. It looks like the seatcovers are aftermarket. (11-15-2018, 06:59 PM)Don C Wrote: Yes, it looks good, but I have to wonder about license plates from different states, then no license plate. Car probably originally from CA, now registered in FL. 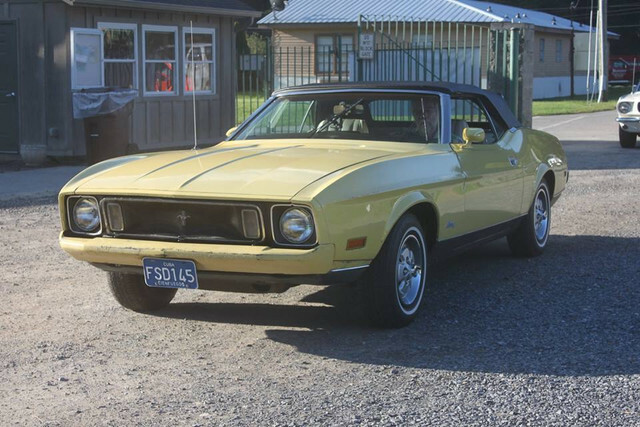 Guy says he's owned it for many years, so the one with the Ford frt plate could be older. This is not an original CA car as the invoice does not have the $13.87 California Emissions Testing line item. Also, the black and yellow CA license plate on front of car is not correct and could never have been used on this car. 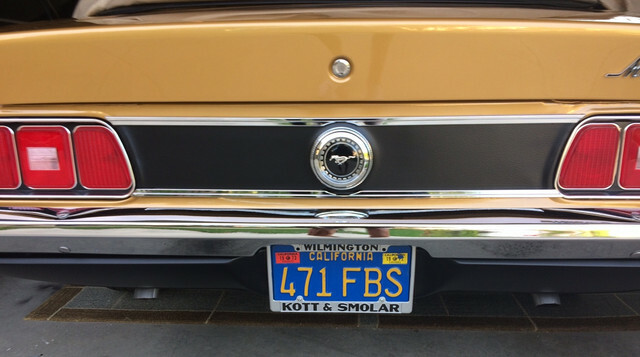 The black and yellow plate was used until 1969 and then switched to a blue and yellow as seen below. Trivia I know, but wonder what the real story is on this car. That car looks very fishy to me, lol. I am a nut about original cars but this is not very original. The AM/FM is out of a big Ford car has the slide bar to balance the rear speakers. 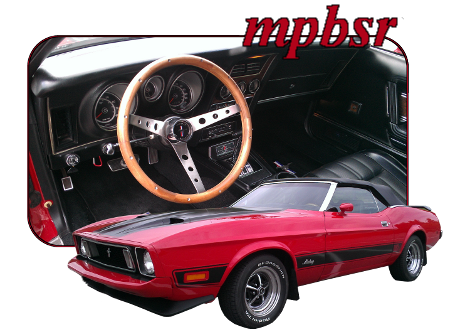 Mustang use the knob to balance. Right Wrong? The Cowl braces have been rattle canned and the shock mounts rattle canned. I see to deer whistles in the grill, lol. 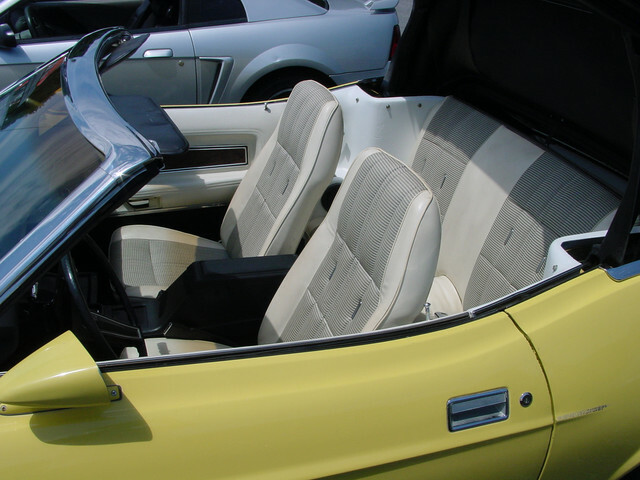 Those seat covers sure look like the early repo of comfort weave with the just imbossed plastic. I would like to see the door sticker to see the actual trim code. Marti's bood only list CW for vert in 73 and that would be comfort weave like in mine. I say that this dog don't hunt and the seller is full of doubt. Take a look at the bidders info, lol. Same guys bid on every mustang out there. I think all they do is play on ebay. The current high bidder has had 65 bid retractions in last 6 months. The one behind him also a player. They bid on every brand of vehicle the one has bid on 241 in last 6 months. ebay needs to change something I would not even list a car there just because of all the jokers. I would say the clock has been rewound on the miles on this one. Here is what the seats should look like. Oh and the license plate on front can be anything mine is from Cuba, lol. There is a place in Florida that will stamp you a new license plate with whatever you want on it. A friend of mine has a 68 428 and I think his is 428-CJ and has North Carolina on it and is legal to run. I agree with David on the interior. It defiantly not original. I have white comfort weave in my 73 vert and it doesn't look like that. (11-16-2018, 08:08 PM)John J Wrote: I agree with David on the interior. It defiantly not original. I have white comfort weave in my 73 vert and it doesn't look like that. The white comfort weave interiors in both your cars is really nice looking. I am with David here in that there is no way this is a 16k miles original car, probably 116k. He does not say that it has original paint.